Laser Vision Correction is one of the most exciting technological developments in the history of advanced eye care. In fact, the word “LASIK” has almost become a generic term for vision correction. However, not everyone is a good candidate for LASIK, because no two eyes are exactly alike. LASIK may not be the ideal corrective approach for you. At the Herzig Eye Institute, we offer all three generations of Laser Vision Correction in order to match the right procedure to the right patient — including the recently approved SMILE procedure, which is only available in a few eye institutes in North America. With all of the options available to our surgeons, finding the right solution for your eyes is just a thorough, complimentary consultation away. HOW DOES LASER VISION CORRECTION WORK? Prior to SMILE, the two most common ways of providing laser vision correction were LASIK and PRK. All three procedures are performed by an ophthalmologist specializing in Laser Vision Correction. LASIK (which stands for “Laser Assisted In Situ Keratomileusis”) is a surgical procedure that uses a laser to correct nearsightedness, farsightedness, or astigmatism. In LASIK, a thin flap in the cornea is created using a femtosecond laser. The surgeon folds back the flap, and then removes some corneal tissue using an excimer laser. The flap is gently placed back, covering the area where the corneal tissue was removed. In nearsighted people, LASIK is performed to flatten the too-steep cornea; in farsighted people, a steeper cornea is the goal. LASIK can also correct astigmatism by smoothing an irregular cornea into a more normal shape. WHEN MIGHT PRK BE RIGHT FOR YOU? With PRK (photorefractive keratectomy), surface cells are removed and the laser is applied. PRK is commonly referred to as “surface ablation,” meaning a laser procedure that is applied to the surface of the cornea. PRK becomes the treatment of choice when:. A pre-existing problem is present on the cornea, which can be eliminated with PRK and result in better vision than LASIK or SMILE. There is a structural abnormality in the cornea that makes LASIK or SMILE unsafe. SMILE stands for SMall Incision Lenticule Extraction, and as the name suggests, the procedure is done with the least disturbance to the surface of the eye. It is a minimally invasive, flapless procedure that combines the advantages of the two previous generations of Laser Vision Correction. Unlike previous generations, the SMILE procedure leaves the surface of the cornea almost untouched — allowing you to get back to the things you love. SMILE is safe, effective, and offers many advantages, including quick recovery time and minimal discomfort during the healing process. For people who are deemed ineligible for any kind of Laser Vision Correction procedure, we are pleased to provide other safe options, such as Refractive Lens Exchange (RLE) and Phakic IOL (PIOL). Also known as Refractive Lensectomy or Clear Lens Extraction, this innovative intraocular procedure is performed on patients with very high levels of nearsightedness (myopia) or farsightedness (hyperopia), astigmatism, and for people who have early lens opacities. People in their middle years may appreciate the dual advantage of a Refractive Lens Exchange: not only will it correct nearsightedness or farsightedness, but it also prevents any future need for cataract surgery. 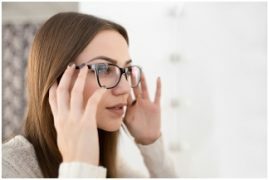 Unlike LASIK or PRK, which reshapes the cornea, Refractive Lens Exchange changes the focusing power of the eye by removing the eye’s natural lens and replacing it with an advanced lens that can provide good distance vision, good reading vision or both. Phakic IOLs are another option available for patients with high levels of nearsightedness (myopia), farsightedness (hyperopia), or astigmatism that are too extreme for Laser Vision Correction, and for whom Laser Vision Correction on the cornea is not safe. The Intraocular Collamer Lens (ICL) is a very thin intraocular lens designed to rest in front of the eye’s natural lens, just behind the iris. Before inserting the lens, the eye is made numb using anesthetic eye drops, and there is very little discomfort associated with the procedure. The surgery typically takes 10 to 15 minutes to perform, and both eyes can be treated on the same day. Your eyes are complex and precious. The Herzig Eye Institute specializes in matching the appropriate treatment to your unique needs to achieve your best possible vision. Whether your treatment involves Laser Vision Correction or one of our other customized treatments, we utilize only the most advanced and proven vision correction technology to ensure we offer the best and safest option to you.